This December there are 10 opportunities to attend a performance of "A Philly POPS Christmas" at the Kimmel Center. Former "Radio City Christmas Spectacular" conductor Todd Ellison is leading the new program, which features a singalong with a "Hamilton" star. Mandy Gonzalez is currently starring in the Broadway hit as Angelica Schuyler. (The Philadelphia production is slated for August.) During the POPS holiday show she will lead the crowd in "We Wish You A Merry Christmas." As a nod to her Latina heritage, she will also perform "Feliz Navidad" and "Remember Me" from Disney's "Coco." The program also features the 65-piece POPS orchestra, organist Peter Richard Conte, the POPS Festival Chorus, the Philadelphia Boys Choir and the African Episcopal Church of St. Thomas Gospel Choir. Expect to hear classic Christmas songs like "Hark! The Herald Angels Sing" and "It’s Beginning to Look A Lot Like Christmas," as well as an original arrangement of "Sleigh Ride" sung by 300 voices. Tickets for the show start at $35. The Wednesday, Dec. 5, performance is sensory friendly. "A Philly POPS Christmas" draws a crowd of 20,000 annually, according to president and CEO of The Philly POPS, Frank Giordano. Show dates usually sell out. 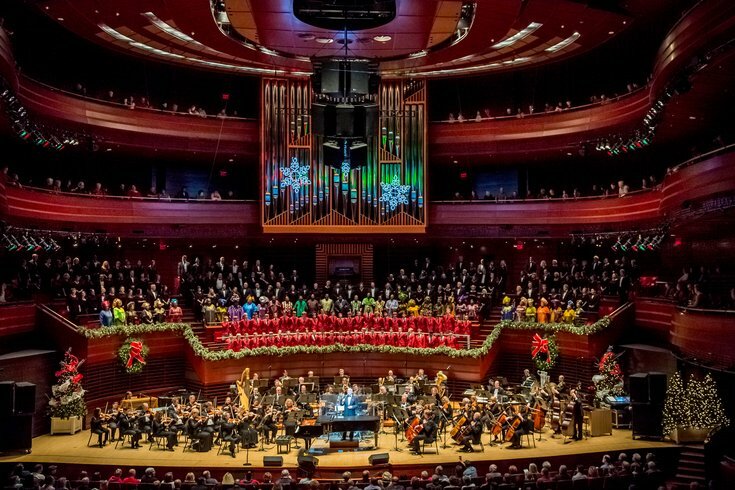 "A Philly POPS Christmas: Spectacular Sounds of the Season"